SACRAMENTO – Sutter Health donated more than 3,350 pounds of non-perishable items to seven food banks as part of the hospital’s month-long campaign to help food banks prepare for the busy holiday season. Boxes of stuffing, gravy, canned yams, rice, boxed potatoes, green beans, cranberry sauce and pie filling filled the donation bins at Sutter Auburn Faith Hospital. 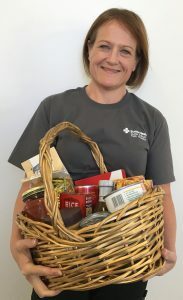 With more than 25 donations sites throughout Sutter Health, physicians, volunteers and employees helped supply seven food banks serving Amador, Placer, Sacramento, Sutter, Solano and Yolo counties. In 2016, Sutter Health donated $255,000 benefiting 30 food banks throughout Northern California, Oregon and Hawaii.